We are not aware of any arrest in the case. Police were looking for a blue Ford Crown Victoria the suspect was seen leaving the area in. Police were also looking for possible video of surveillance from the scene. There were no immediate arrests. The victim was transported to Harborview for treatment of his injuries. Pike/Pine robbery: The victim in the robbery never saw the weapon — or the people who held him up — but a witness told police the victim was robbed by a group with a handgun in an incident around 10th and Pike just before midnight Saturday. According to SPD radio dispatches, police found the victim at 10th and Pike but he was unable to provide much information other than a silver iPhone had been stolen. Police got a better description of the group from a restaurant employee who saw the robbery and were able to track down one man matching the description of someone in the group. He was taken into custody for investigation of robbery and an outstanding warrant. The phone was not recovered. Earlier in the night, police responded to a similar stick-up at 6th and Olive. Earring thief: The suspect in a Thursday January 11th shoplifting incident at the Capitol Hill Goodwill made quite the scene after being confronted about her suspected theft of earrings by employees: Employees told police the suspect was last seen on E Olive Way — still wearing the stolen earrings. The suspected squatter was booked for investigation of burglary. Shoplifter pulls gun: An incident at the 23rd and Madison Safeway reported on January 23rd shows why employees may not always want to intervene with a suspected shoplifter. Police were called to the store around 12:30 PM to a report that a shoplifting suspect had pulled a gun on an employee as he attempted to leave the area of the store. Police were searching for the truck the armed man used to flee the scene but had no luck, according to East Precinct radio reports. Neumos fire alarm: The Tuesday night set from Swedish hip hop artist Yung Lean was just too hot. 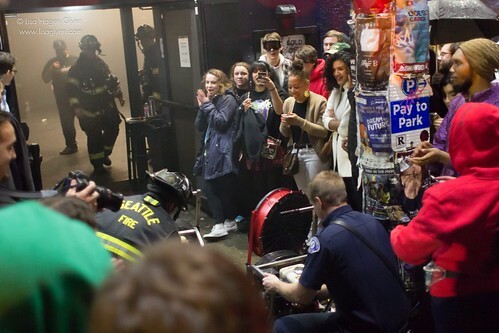 Seattle Fire was called to E Pike club Neumos around 10:20 PM after the venue was cleared when the fire alarm went off. SFD units arrived to find a big crowd waiting for them on the street outside but no fire, fortunately, inside the club. Smoke machines reportedly set the alarm system off. The Harvard Market parking lot is private. Can’t they close it or patrol it at night? It seems like every other weekend there’s a problem here. Presumably it’s a gang hangout or a drug market (or both)? Do we still have police in Seattle? the Harvard Market owners need to do more to make it a safer area. Even during the daylight hours it”s a very tense shopping experience. People hangout on the stairs and outside the QFC. They refuse to move and get confrontational if you say anything. Why don’t they a security team?